Introduction: Laparoscopic pancreatic resections for cystic neoplasms of pancreas are limited to small retrospective case series as these neoplasms are rare. We critically analyzed the indications for and outcomes after laparoscopic resection of pancreatic cystic neoplasm a tertiary referral centre in South India over 8 year period. 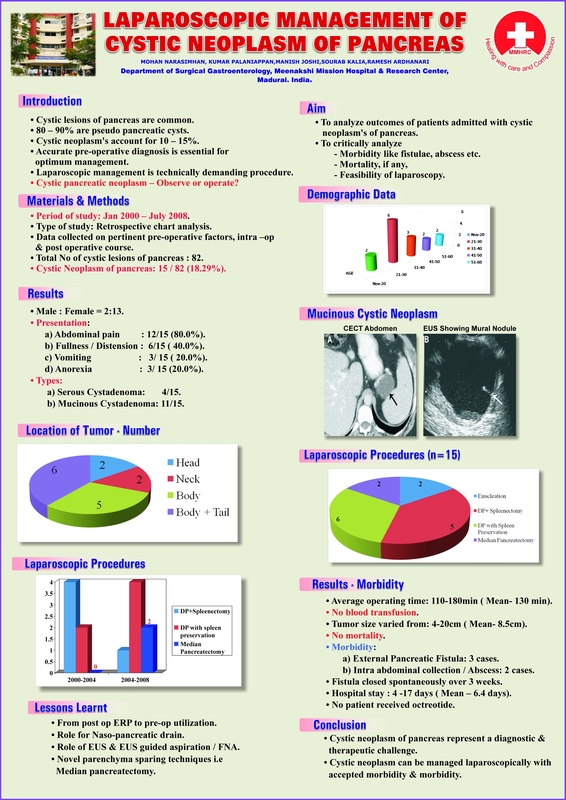 Methods :A retrospective analysis of data collected on pertinent pre-operative factors, intraop & post operative course with a short term follow up was done.15 selected cases were successfully completed laparoscopically. Results: Majority of patients were females (86%) and all were symptomatic at presentation. Abdominal Pain was commonest symptom.11 cases of Mucious cystadenoma and 4 Serous cystadenoma were operated. 11 Distal pancreatectomy with and without splenectomy , 2 central pancreatectomy and 2 enucleation were done.Mean operating time was 130 minutes. There were no conversions or blood transfusions. Mean tumor size was 8.5 cm. Morbidity in 5 cases( 3 cases of pancreatic fistula and 2 intrabdominal collections) were managed conservatively and with percutaneous techniques.mean hospital stay was 6.4 days. Conclusions: Laparoscopic pancreatic resections for cystic pancreatic neoplasms is feasible and safe and can be offered to selected patients. Morbidity of surgery reduces with surgical experience in advanced laparoscopic techniques.